If there was ever a draft to pick your franchise defensive tackle, the 2015 draft is it. That is great news for NFL teams in need of a good front 7. For former Oregon defensive end, Arik Armstead, it presents a challenge to stand out among the long list of projected first-round defensive ends, such as Florida’s Dante Flowler, Nebraska’s Randy Gregory, USC’s Leonard Williams, Missouri’s Shane Ray, and Washington’s Danny Shelton to name a few. If it were any other draft, Armstead would be one of the first defensive linemen taken in the draft, no question. 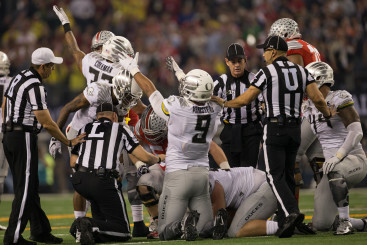 However, Armstead has to have concerns even getting drafted in the first round. Here are a few teams that I could see picking up Armstead. Fun fact: our photographer had to use a step ladder to take this photo. Okay, not really. For a team that is historically known for its’ pulverizing defense, the Bears had a laughably bad defense last season. The Bears gave up the 2nd most points of any team in the NFL (442), behind the Oakland Raiders(452). The Bears fired their former defensive coordinator and hired former 49er’s defensive coordinator, Vic Fangio. Fangio is an advocate of the 3-4 scheme, and will most likely begin to build his defense with pieces from this rush-heavy draft. 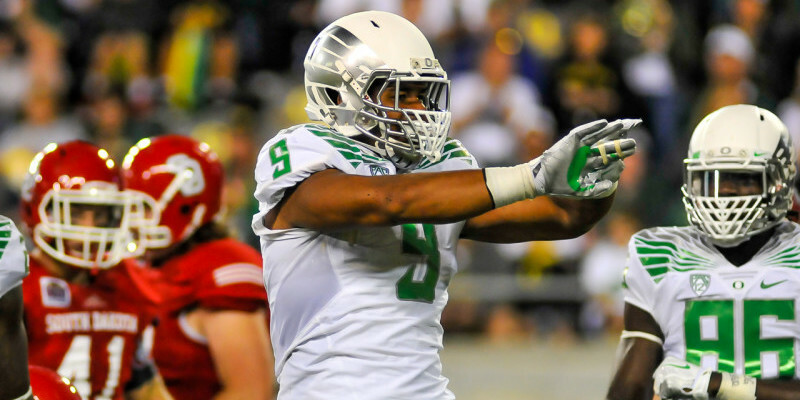 Armstead thrived in the 3-4 systems at Oregon. While taking Armstead with the 7th pick may be a bit of a pipe dream, it is not too unrealistic to expect the Bears to swipe Armstead in the 2nd round if he were to fall that far – especially considering that the Bears may end up focusing on a replacement for Brandon Marshall with their first pick. The Lions had the 2nd best defense in the NFL last year, behind only the Seattle Seahawks. That title is in serious jeopardy, as the team took a major hit to the defensive line in the offseason, loosing both Ndamukong Suh and Nick Fairley. They were able to compensate by signing defensive tackle former Duck, Haloti Ngata, and were able to hold on to their lead tacklers Tahir Whitehead (MLB) and Deandre Levy (OLB). Yet, there is still a hole on the defensive line for Detroit, specifically on the edge. With the team’s first pick coming at 21, Detroit has the perfect opportunity to secure Armstead. 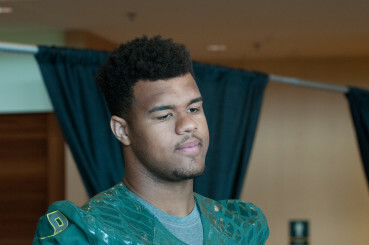 Arik Armstead at the national championship.